From late March onwards, the tiny new leaves on the trees start to grow and by April, the hills of Umbria are a carpet of vibrant green. Cherry trees and May trees blossom, the temperature starts to rise and skies are blue. One of Umbria’s most interesting medieval towns sees the race of the ancient “Ceri” (Candles) through the tiny cobbled streets and up the mountainside to the church at the top. There is a fabulous atmosphere and it’s wonderful to see all generations join in the celebrations. Dating back to medieval times, the town of Gubbio has always been in competition with the town of Sansepolcro, just over the border in Tuscany, to see who has the best crossbow archer. This “Palio” or competition is held between the two teams and a challenge match is held in Sansepolcro in September. This gorgeous and perfectly restored medieval hilltop town is host to the annual Infiorata (The Flowering). Artists draw pictures on the cobbled streets, which are then filled in with brightly coloured flower petals. A prize is awarded to the best design! Fields full of sunflowers, vines slowly ripening in the summer sun, balconies draped in bright red geraniums and roses blooming. Temperatures can reach 35 degrees or more. Days are long and each tiny village holds its summer “Sagra” or celebration of life, which usually involves plenty of traditional Umbrian food, lots of good wine and an Italian band playing Ballo Liscio with an accordion and double bass! The capital of Umbria resounds with the music of Umbria Jazz. This international music festival brings together artists like Keith Jarrett, Santana and Elton John. All the wine bars, restaurants and pubs have a live band and musicians get together for jamming sessions into the tiny hours! This gem of a medieval town in the Montefalco region of the Vale of Umbria holds a festival celebrating medieval traditions. The ancient cobbled streets are filled with stalls selling authentic arts and crafts from the medieval times. The international music festival takes place in the beautiful city of Spoleto with concerts held in the Roman amphitheatre, the square in front of the Duomo and the two theatres. The tiny and beautifully restored medieval hilltop town of Montone is host to the annual Umbrian Film Festival with movies shown outdoors on a huge giant screen in the main square. The festival was started by Terry Gilliam and is a magical event. During August the beautiful hilltop town of Corciano comes alive as locals dress up in medieval costumes and celebrate the Middle Ages with processions, concerts, exhibitions, poetry readings and medieval music. The bars and taverns are packed and offer delicious Umbrian food cooked to ancient recipes. Umbria revels in its medieval history and no where more so than Montone. Every year, the villagers dress up in wonderful medieval costumes and parade through the centre to celebrate the holy relic, the Santo Spino, given as a gift to the legendary mercenary, Fortebraccio, ruler of Montone in the middle ages. The Sbandieratori (Flag Throwers) of Sansepolcro demonstrate their skills in a colourful spectacle not to be missed. An interesting archery competition between the three Terzieri factions of Assisi as crossbowmen celebrate the Palio of San Rufino. 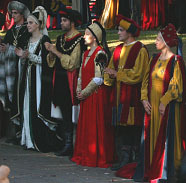 There is a colourful procession in medieval costume and the winning Terzieri is presented with a Drappo painted by a local artist. September sees the “vendemia” or harvesting of the grapes and October brings in the Mushroom season. Porcini mushroom are highly prized and locals take to the chestnut woods in search of them! At the end of October it is time to gather the olives for the first pressing to make Extra Virgin Olive Oil. A great chance to see the Italians celebrating their history with this celebration of the 1800s in Umbertide. There is a wonderful mixture of music, culture and traditional food. There are concerts, dancing, a chance to hear the town band playing and readings of 19thC poetry. A yearly festival of classical music with concerts taking place in beautiful locations in Città di Castello, San Giustino, Morra, Citerna, Montone, Sansepolcro and Fontecchio. A great chance to discover the Upper Tiber Valley and hear some great music! This medieval and renaissance town is host to the Truffle fair. Huge marquees fill the main squares and the air is full of the heady scents of black and white truffle, salami from Norcia, Porcini, Olive Oil, Pecorino cheese and roasting chestnuts. The olive oil mills are open for visitors to see how this precious resource is made and learn what makes the best quality Extra Virgin Olive Oil. Winter in Umbria means log fires, crisp days, bright sunshine, wood smoke, and snow! Hearty Umbrian food and red wine help the winter days pass by. At Christmas, many of the towns have live nativity scenes and on New Years Eve the main square in each village and town will be packed with people dancing to a live band to see the New Year in!